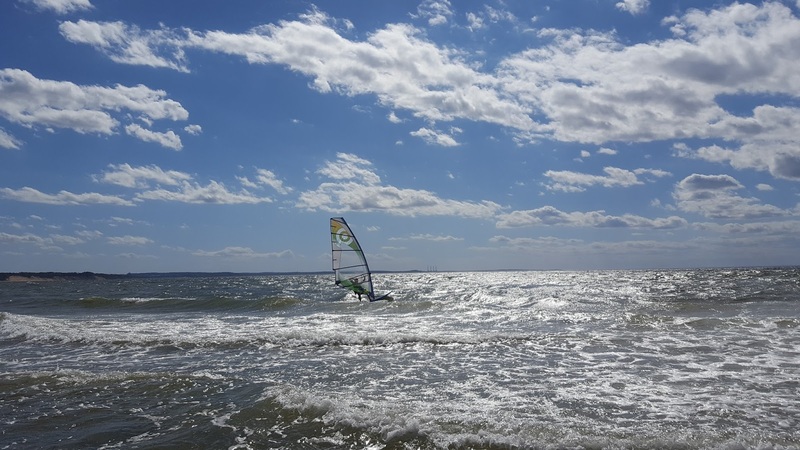 Great windy/sunny day at WM beach last Sunday 6/12/16. 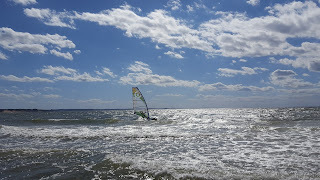 NW wind, kept going up and down (4.7 to 6.5 sizes) but still a lot of fun especially at low tide. Wind Meter from tonywind on Vimeo. I finally pulled the trigger on a SUP board about a month ago. It's an "old" (2009) starboard superfish 9'8". I got it quite cheap for a brand new SUP that's also sailable. At 140 liters, it floats enough for me to paddle on it comfortably although it's quite lively. 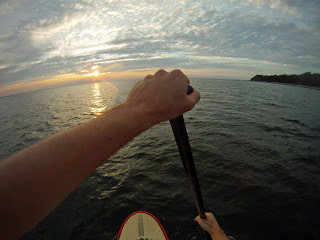 I went many times flat-water SUPing and really enjoyed it. It still glides considered the small volume. I now hope to catch some waves with it at Cupsogue. The were a couple of good days (mostly wind swell) that I missed but hopefully we'll get more solid surf soon. Even if it's not designed to plane, I'm curious how this board will behave as a windsurfer on flat water (I can put footstraps on it). More later! As many others I have not missed the wind call last Sunday. Summertime at its best. We should get more of these cold fronts. Even on the North Shore the wind was 5.0-5.5 grade by the late afternoon. I rigged a 6.2 at first but that tired me out quikly. Rigged down to 5.8 and had a blast. I didn't mind being a bit overpowered as the are always gusts and holes at west meadow under these conditions. The chop was also disorganized or with a short period (about a board length) and therefore hard on one's knees. Not easy to get good speed and decent port tack jumps. But no complains after all also considered the nice little crowd of North Shore windsurfers and kiters too. Looking for more of this, hopefully later this week. 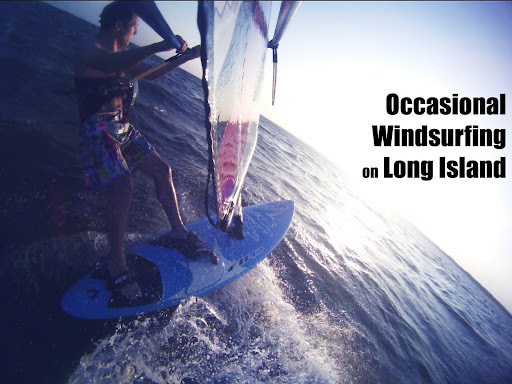 I'm pondering whether to change the blog title to "Rare windsurfing...." I have only sailed 3 times this year. Once in June and twice in July. After a tough working week, I decided that last Thursday forecast (SW winds gusting up to 30 knt) was a well-deserved gift from God so I headed to Shirley at round 3pm. The beach perennials (Steve and James) where already out on 6.0-ish. I rigged the 5.5/90L combo. Boys, it felt good to be on small gear after so long. Sweet port tack jumps! Obviously, after such a long period of inactivity, I could barely water-start but things are coming back... I had not crossed James in long time and (after seeing him wearing a helmet) my question were about the unfortunate accident that occurred at Shirley last year during the passage of hurricane Irene when Joe Rocco lost his life. James was the one who first pulled Joe out of the water. He told me the bay was littered with huge debris that day (such a massive chunk of dock). Joe had sustained severe head injuries but his board and fin didn't show apparent signs of damage as if he had hit a floating debris at full speed. James' rule is "always wear a helmet when it gets rough" and I think I'll stick to that too. James schlogging is way in after the wind dropped a notch. The cloud at the horizon is a big thunderstorm coming our way.